Comments: Free Shipping for orders over $150 for any combination of manufacturer products shipped from this location. Epi-Pet's Skin & Coat Enrichment Spray (Cedar/Mint) is a veterinarian developed natural ingredient based non-medicated skin and coat care product for dogs. This product promotes healthy skin and coat on dogs and is recommended for use on normal healthy skin and coats and on dry, flaky, itchy, oily and odorous skin and coats. Ingredients are included that moisturize, cleans, condition, deodorize and enrich your dog's skin and coat. This product promotes healthy supple skin, a soft shiny coat and a fresh cedar/mint scent on your dog. Veterinarians recommend routine use of skin and coat enrichment sprays. Epi-Pet's 16oz Skin & Coat Enrichment Spray (Cedar/Mint) is a veterinarian developed natural ingredient based non-medicated skin and coat care product for dogs. This product promotes healthy skin and coat on dogs and is recommended for use on normal healthy skin and coats and on dry, flaky, itchy, oily and odorous skin and coats. Ingredients are included that moisturize, cleans, condition, deodorize and enrich your dog's skin and coat. This product promotes healthy supple skin, a soft shiny coat and a fresh cedar/mint scent on your dog. Veterinarians recommend routine use of skin and coat enrichment sprays. 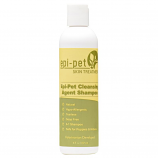 The Epi-Pet Shampoo promotes healthy skin and coat for dogs and cats. This is a veterinarian developed non-medicated natural ingredient based shampoo that is designed to clean, condition, soothe, moisturize, deodorize and enrich the skin and coat of your pet. 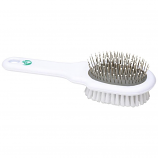 It is recommended for use on healthy pet skin and coat and on dry, flaky, itchy, oily and odorous pet skin and coat. This product is specially formulated to encourage healthy supple skin, soft shiny coat and fresh lavender/vanilla scent on your dog or cat. 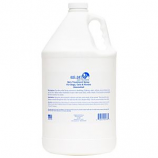 Veterinarians recommend routine use of this product when bathing your dog or cat. Safe for use on puppies and kittens. 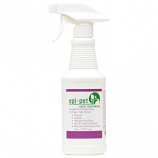 The Epi-Pet Shampoo promotes healthy skin and coat for your dog or cat. This veterinarian developed non-medicated natural ingredient based shampoo is designed to clean, condition, soothe, moisturize, deodorize and enrich the skin and coat of your pet. 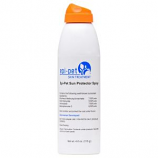 It is recommended for use on healthy pet skin and coats and on dry, flaky, itchy, oily and odorous pet skin and coats. This product is specially formulated to promote healthy supple skin, soft shiny coat and fresh lavender/vanilla scent on your dog or cat. Veterinarians recommend routine use of this product when bathing your dog or cat. Safe for use on puppies and kittens. 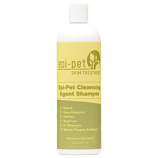 The Epi-Pet Shampoo promotes healthy skin and coat for dogs and cats. This veterinarian developed non-medicated natural ingredient based shampoo is designed to clean, condition, soothe, moisturize, deodorize and enrich the skin and coat of your pet. It is recommended for use on healthy pet skin and coat and on dry, flaky, itchy, oily and odorous pet skin and coat. This product is specially formulated to promote healthy supple skin, soft shiny coat and fresh lavender/vanilla scent on your dog or cat. Veterinarians recommend routine use of this product when bathing your dog or cat. Safe for use on puppies and kittens. Use this product for year round ear care on dogs, cats and horses. Use for dirty, oily, flaky, itchy and odorous ears. 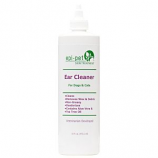 This is a veterinarian developed non-medicated, non-irritating, natural ingredient based ear wash that gently removes wax, debris and dirt from the ear. Moisturizers and conditioners promote healthy skin of the ear and lavender essential oil provides a fresh scent. Use this product for year round ear care on dogs, cats and horses. Use for dirty, oily, waxy, flaky, itchy and odorous ears. 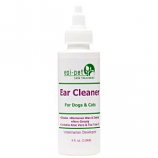 This is a veterinarian developed non-medicated, non-irritating, natural ingredient based ear wash that gently removes wax, debris and dirt from the ear. Moisturizers and conditioners promote healthy skin of the ear and lavender essential oil provides a fresh scent. The 4 oz. bottle is designed with the bag-on valve, so you can conveniently spray it at all angles for easy application! Boxers, Dobermans, Bull Dogs, Pit Bull Terriers, Bull Terriers, Bichons, Poodles, Schnauzers, etc all need sunscreen. Any pet with short and thin hair, white and light hair, white and pink skin, and all pets subjected to excessive sun exposure such as: Boaters, Swimming Pool & Beach Bum Dogs, Hikers & Snow Skiers, Dog Park, Outside living pets, Shaved down pets, Working dogs, Allergic and inflamed skin, Hairless dog breeds. 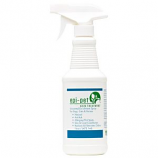 Epi-Pet's Equine Skin & Coat Enrichment Spray (Cedar/Mint) is a veterinarian developed natural ingredient based non-medicated skin and coat care product for your horse. 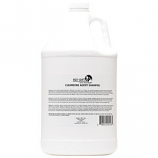 This product promotes healthy skin and coat and is recommended for use on normal healthy equine skin and coats and on dry, flaky, itchy, oily and odorous equine skin and coats. Ingredients are included that moisturize, cleanse, condition, deodorize and enrich your horse's skin and coat. This product promotes healthy supple skin, a soft shiny coat and a fresh cedar/mint scent on your horse. Veterinarians recommend routine daily use of skin and coat enrichment sprays to maintain healthy equine skin and coats. Untangles mane and tail. Epi-Pet's Equine Skin & Coat Enrichment Spray (Lavender Scent) is a veterinarian developed natural ingredient based non-medicated skin and coat care product for your horse. 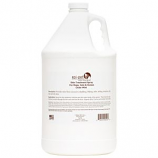 This product promotes healthy skin and coat and is recommended for use on normal healthy equine skin and coats and on dry, flaky, itchy, oily and odorous equine skin and coats. Ingredients are included that moisturize, cleanse, condition, deodorize and enrich your horse's skin and coat. 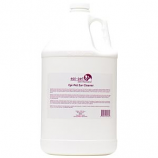 This product promotes healthy supple skin, a soft shiny coat and a fresh lavender scent on your horse. Veterinarians recommend routine daily use of skin and coat enrichment sprays to maintain healthy equine skin and coats. Untangles mane and tail. Promotes healthy skin and coat for your dog. A veterinarian developed natural non-medicated product for healthy skin and coats and for dry, flaky, itchy, oily and odorous skin and coats. Specially formulated with ingredients that clean, condition, moisturize, deodorize and enrich your dog’s skin and coat. Encourages healthy supple skin, soft shiny coat and fresh lavender scent on your dog. Veterinarians recommend routine use of healthy topical spray products for you dog. 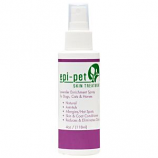 The Epi-Pet Skin & Coat Enrichment Spray (Unscented) is a veterinarian developed natural ingredient based non-medicated skin and coat care product for dogs and cats. This product promotes healthy skin and coat on dogs and cats and is recommended for use on normal healthy pet skin and coats and on dry, flaky, itchy, oily and odorous pet skin and coats. This is a hypoallergenic product and is specially formulated for dogs and cats with sensitive skin. Ingredients are included that moisturize, cleanse, condition, deodorize and enrich your pet's skin and coat. This product promotes healthy supple skin and a soft shiny coat on your dog or cat. Veterinarians recommend routine use of skin and coat enrichment sprays for your dog or cat.